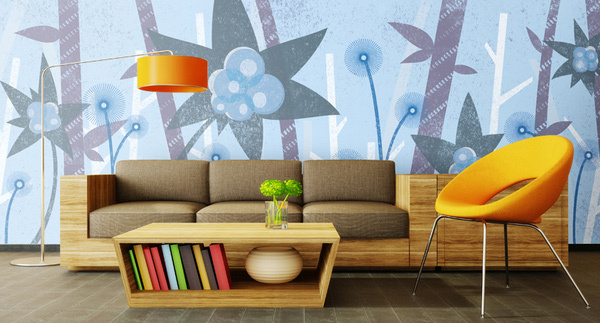 Today, we will be featuring living rooms with wallpapers, we did a list before about wallpaper murals, but this time, we will be featuring 15 Living Room with Floral Wallpapers. We have friends who prefer wallpapers because we can use prints that we want to see every day. 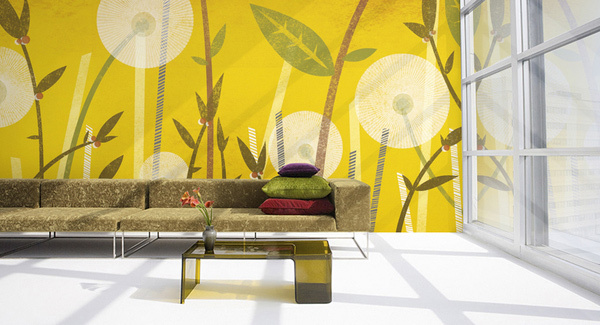 Unlike regular paint, wallpapers are easier to go about. 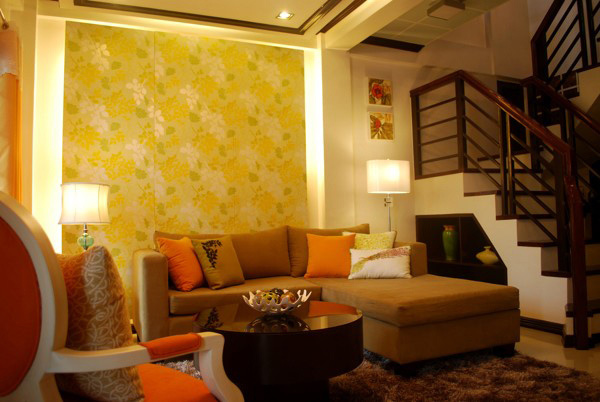 It comes in different colors, and sizes and sometimes, it can cover the entire wall inside the house or just a certain wall to serve as accent walls. 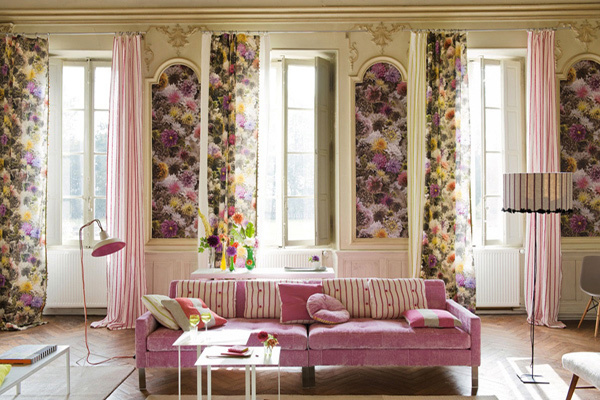 We will be showcasing 15 Living Room with Floral Wallpapers that are interesting since we can contact designers to make specific designs we want and make sure that the wallpapers we have at home is one of a kind and really pretty. Below, you will see different types of flowers – the regular flowers or the digitally enhanced ones, sometimes in different colors or in black and white. Take a look! Be amazed with the combination of blues and browns in this living room! 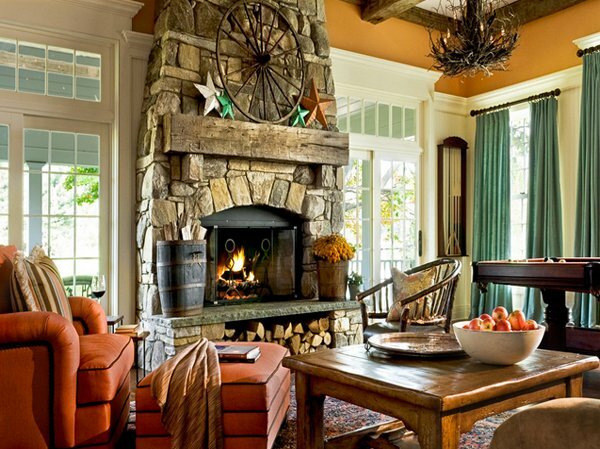 The orange accent chair and the lamp pops out which makes this room look real pretty. Statement living rooms don’t come much more striking than this. Inspired by the watercolors of Monet and Manet, furniture and soft furnishings in watery blues are layered against a super-sized floral backdrop to create a room that’s a modern masterpiece. 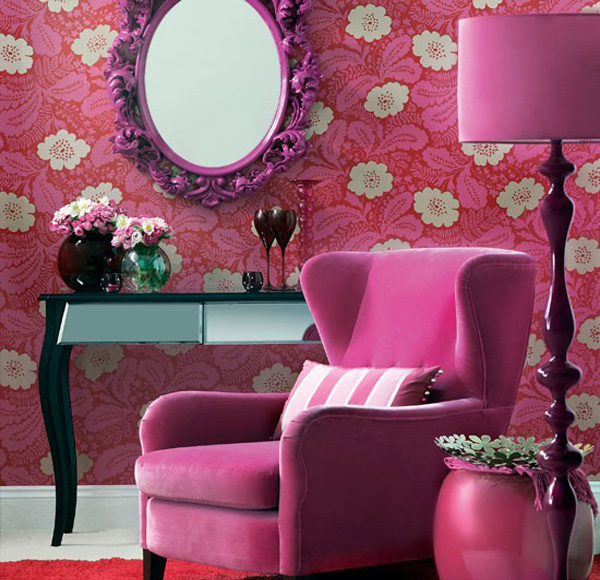 The hot colors of this floral wallpaper give this room a modern edge. The teal shade is also picked up in the accessories for a fresh, modern look. This folky living room uses accessories that pick up the colors in the wallpaper for a together look. 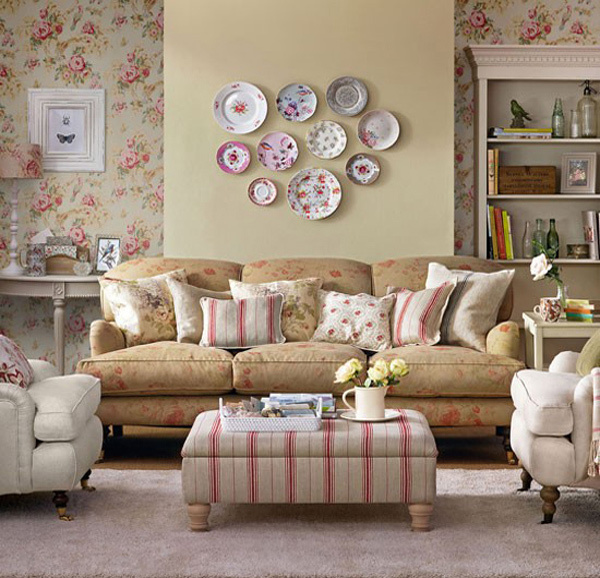 If you like vintage style, team a country floral wallpaper with fabrics in ticking stripes. Create a unique wall display of pretty china picked up from charity shops and car-boot sales. This contemporary living room has a great view which was taken advantage by the designers by letting the sofa face the big window. Black and white never goes out of style as they say! This wallpaper showcase flowers and leaves in black and sure looks stunning from this angle. The blue flower prints for the wallpaper complement the sectional sofa that we have in this living room. This wall with the wallpaper serves as the accent wall in this space. 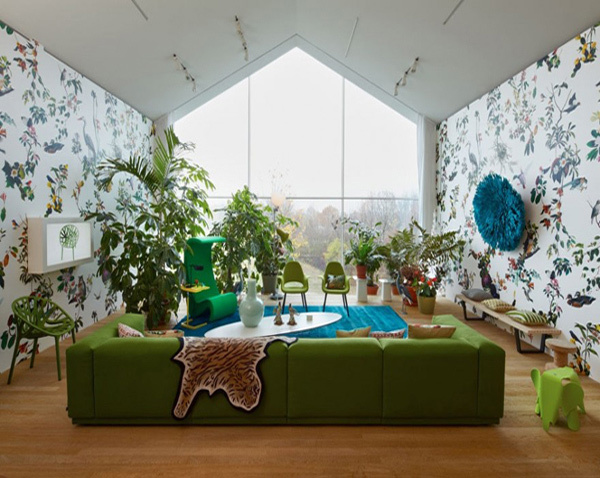 The use of the moss green sofa camouflaged with the yellow wallpaper. It seems like you are staring at a sofa in the forest. The ambiance of this living room makes you wanna sleep. The lighting treatment made the yellow wallpaper seem orangey that eventually made it too cozy to sleep! The color combination that this space has is pretty much simple but sure is eye-catching! The colors used by the designer reflect that of spring and incorporated it too with the curtains to blend well with the walls. Traditional floral wallpaper is created with a repeat, but this custom, hand-painted wallpaper from Fromenta appears to be freshly unique at every spot. 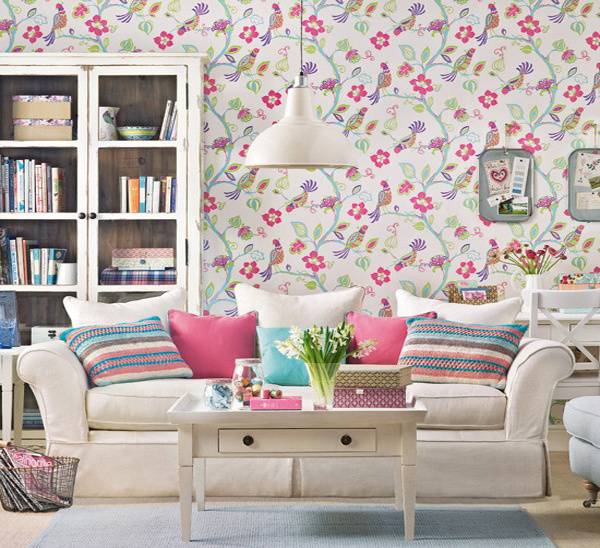 This delicate floral wallpaper is the perfect backdrop for pastel furnishings. 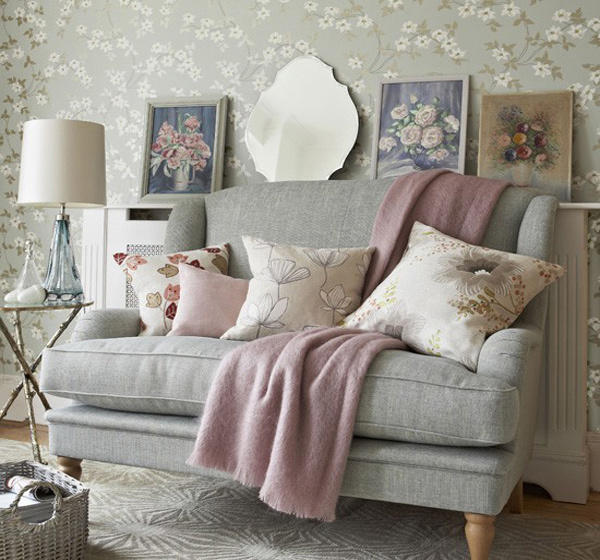 The grey sofa, floral paintings and dusky pink accessories complement the tones of the wallpaper. Oversized floral wallpaper can be teamed with simple bold accessories to create the right balance. The use of bright lighting will bring those colors and patterns to life. According to the Interior Designer of this home, this space in Atlanta was the apartment of the 2013 Cathedral Inspiration House. We looked for the dramatic in color and pattern when putting this project together. 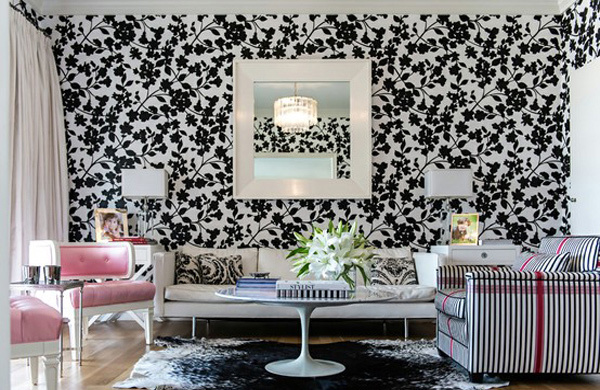 From the Designers Guild wallpaper and floral fabric to the bold use of black and white. The entire space reads glamour with an edge. 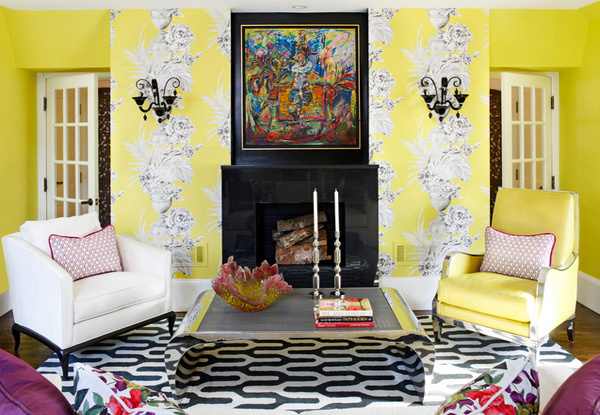 Whatever the reason home owners choose to use wallpapers for their homes, whatever the design or the motif, what’s important is that the main goal of making one’s home pretty and conducive for all the members in the family. 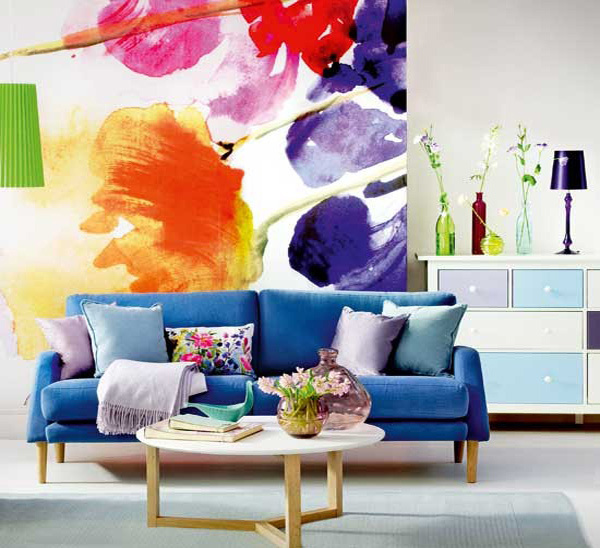 We hope you liked the 15 Living Room with Floral Wallpapers and check the 15 Living Rooms with Interesting Mural Wallpapers and decide which ones you would have. Happy choosing!